This title has had tons of publicity and hype built via the internet and with a lot of hype comes a lot of high expectations. Dead Island failed in no way to deliver. 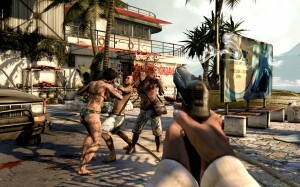 Dead Island brings all the fun of destroying zombie hordes with the ability to create and modify your own arsenal of weapons and skills. In this review I will be going over the pro, the cons, and the downright awesomeness of this release. Graphically speaking, the terrain is somewhat spectacular, I know that seems like a good, but where the terrain looks good other aspects lack. Primarily the zombies themselves and the vehicles are a bit simple. For a game this far into the graphically amazing generation that we game, this point cannot be overlooked. I believe that the developers had been using a platform with lackluster performance so as to make the game viable on a large array of systems and the only way to keep size small they didn’t want to make a multitude of different texture packages for each individual zombie. More on this in the good section as it ties with a great aspect. The bad also continues with a bit of a bug PC version wide. The gamma adjustment setting for the game is off by a long shot making people play the game with a severely over saturated effect. Leaving the gamma default makes some parts of the game a bit too dark but quells the saturation effect drastically. This may be a bit of a hindrance for PC folk, however, it does not seem to affect people running Dead Island on consoles as bad. The last bad is a bit from player error but it should not be this superfluous in a persistent environment. When you throw a weapon at an enemy and the weapon lays on the ground after its usefulness has been employed, if you die… the weapon is lost forever as the area “resets”. In a game where you are able to throw any and everything you can pick up why would you employ this feature? Ok, maybe I am not thinking within normal boundaries here but to be fair one of the Characters is a Thrown Weapons Specialist. If you throw a weapon you maxed out in upgrades and was a very rare find and you happen to back too far away or die, you have just completely lost your primary hardware for defeating enemies. This may not be a big deal in the early game but later it becomes a bit of a big deal as weapons can cost a lot of money. Now on to the good, and for every bad I can name at least 10 good aspects. That is a pretty good ratio if I do say so. First and foremost, the environment, I find that the world itself is beyond beautiful. There are a ton of winding pathways and back alleys. There is always at least two ways of reaching your destination, if not more. 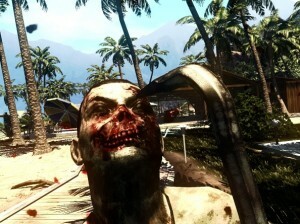 With that being said, you need a great graphics processor to really enjoy the vast beauty that is Dead Island. 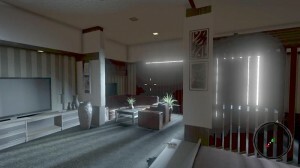 With max settings the game looks almost like a window to the outside and that alone is worth the investment. Even on the lowest settings the game is graphically very impressive as it only drowns out some foliage and other non action oriented items. 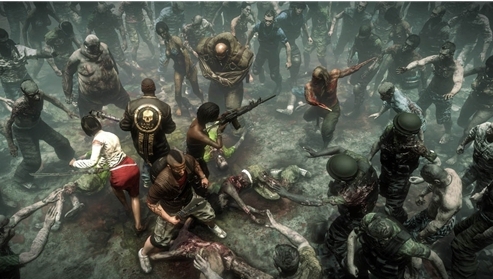 With this world being as big as it is you need a variety of enemies and with Dead Island it is delivered it ways other imagined. In other games where the world is rather large you find that many of the enemies are just a recolored or reskinned hatchling of a low level mob. Not here, there are so many different enemies that just walking through the game you would think it almost a reality to have so many “people” running around. With this aspect comes the fact that you cannot reskin each mob to reflect multiple levels of graphical detail. The rendering is softened by option but it leaves them looking a bit less than premium at max due to this. Either way, this makes you as a player feel much more involved in a real world situation than a repetitive hack n’ slash style genre. Weapons weapons and more weapons. Have you ever since “Shaun of the Dead” thought of the multitude of ways to destroy a zombie? This game gives you that and so much more. You can pick up almost any item and use it as a weapon against the hordes of murderous brain eaters or even take some of them and give them a bit of a more lethal edge, for example taking a bat and adding nails to the end. If you really don’t care for that why not jump up and drop kick your opponents and then kick their face into the dirt. The ability to decapitate and dismember these piles of meat via anything sharp makes for a fun gathering of friends by the beach. As for guns, yes there are some, why bother grabbing those up except in the event that your sickle should break or your 2×4 piece of lumber snap in half and already have been thrown at the enemy? There are an array of guns though for those wanting to snap off a few well placed shots and see heads explode into a gory mess behind their target. Characters, the different style of play are not restricted to the chosen character though each have their specialty they can wield anything you want them to. That being said lets have a bit of an idea of each one shall we? 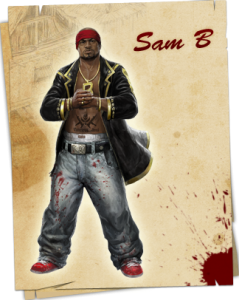 Sam B as the Tank-class of the group has the ability to sustain heavy damage and handle numerous foes at the same time. 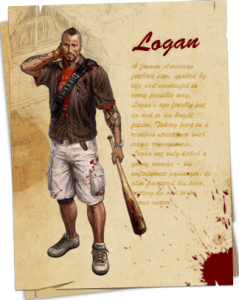 His special ability is “Fury,” which is achieved by filling up a bar by killing zombies. He is also an expert in blunt weapon usage. During a Fury attack Sam can one hit kill zombies with his bare hands. The three branches of his skill tree are Fury, Combat, and Survival. 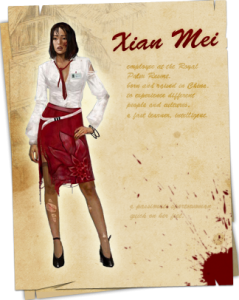 Xian Mei is the assassin of the group with a particular predilection toward bladed weapons. The three branches of her skill tree are Blood Rage, Combat, and Survival. 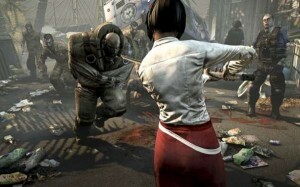 Her special ability is to enter a rage mode to deal extra damage to opponents with her knife. Logan Carter is the jack of all trades within the team. He specializes in thrown weapons and some blunt weapons. His rage mode allows him to throw an infinite amount of knives at nearby zombies. Purna is the support within the team, and a firearm expert. When her Rage mode is activated Purna has unlimited ammo with her Revolver. The RPG element is very well done. It is similar to Borderlands in that you level up and select a skill under one of three trees and progress further as you add points to a tree. You can mix and match and make your character completely unique to the style in which you play said character and to me that is a huge plus. Dead Island does not let you get behind whatsoever. When you level the enemies in which you encounter are as well your level and thus makes the game progressively harder whether or not you quest or grind your way to max level. to cjeck outt your site onn my iphone during llunch break. I enjoy the knowledge you provide her and can’t wait to take a look when I get home. even using WIFI, just 3G .. Anyhow, superb blog!